Yet another in the recent New Year series: a camera this time – for Carol. Her eyes were swayed by a relative giveaway price for a Canon EOS 550D on good ol’ Amazon. Her old 400D has stood her in good stead for a few years but neither of us was inclined towards the 600D with its fragile-looking articulated rear screen. So, a bargain basement price, one beating Warehouse Express (or WEX Photographic, as they now prefer), for an older model seemed quite appealing. It arrived yesterday, on the same day as this brand spanking new desktop. It must have been delivery Wednesday, because my Amazon-supplied spindle of 25 DVD RWs arrived as well. 3 out of 3 – great! Carol’s camera arrived by Home Delivery Network. There was a tracking number for the shipment and fascinating it proved to be, too. I couldn’t resist diagramming the camera’s journey on Google Maps and here it is, below. There are two flags on the map, the northernmost of which is Amazon’s warehouse at Ridgmont, Bedfordshire. The slightly more southerly flag is our house, also in Bedfordshire. 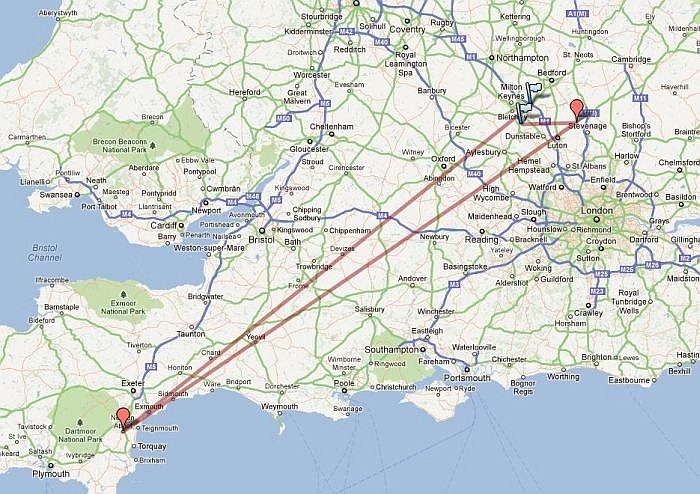 The red line is the cameras journey calling in first at Newton Abbot, Devon, then Hitchin, Hertfordshire (still further away from us than it began), before pitching up chez nous. To paraphrase Mr Spock, logic must dictate such a scenic route, but it made me laugh! Now I’m off to amazon to see if I can understand the camera bit. New desktop? What’s this? If you had kids, I’d say you were ski-ing.